This study assesses the role of feed-in tariffs (FITs) and renewable energy certificates (RECs) in creating incentives for cross-border investments and for investments in particular technological portfolios via M&A. The analysis explores the dataset on M&As in alternative energy sources worldwide over 2005‑2011. The results suggests that FITs encourage more diversified M&A than RECs. 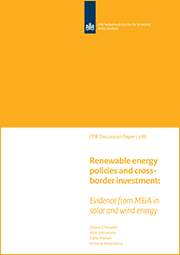 With respect to foreign investment, the study finds a linear relationship between FITs and cross-border M&As in the wind energy sector, but an inverted U-shaped relationship in the solar energy sector. One possible explanation for the latter may lie in reduced policy credibility due to the public finance implications of ‘generous’ FITs. Another possible explanation for this finding concerns the use of high solar FITs by countries whose natural conditions provide little comparative advantage in solar energy, suggesting that low profitability and limited potential of solar energy in those countries might have deterred the entry of foreign investors.